"Disturb not the harmony of Fire, Ice, or Lightning lest these three Titans wreck destruction upon the world in which they clash. Though the water's Great Guardian shall arise to quell the fighting alone its song will fail. Thus the Earth shall turn to ash. O, Chosen One, into thine hands bring together all three. " Edit: It went completely viral on facebook omg ;_; 6.3k shares in barely 3 hours, it’s amazing! Also I got a HUGE demand for merch and shirts of it so here you go! Edit 02: Now 41K+ shares, 1.7K comments and 3.5 millions reach, almost 6k new likes on facebook, this is crazy ;-; Kotaku made an article about it too, which made me burst into tears. I wasn't expecting so much love from this, I am seriously speachless! 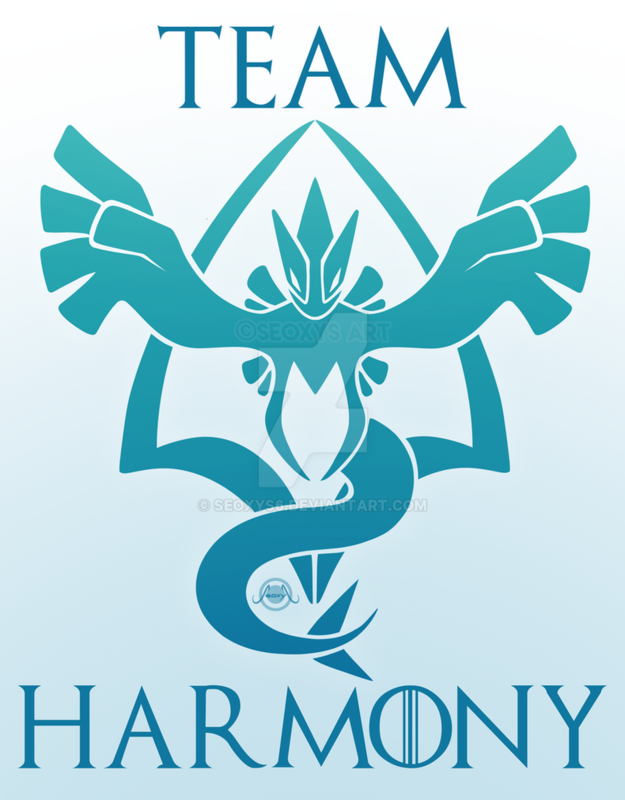 I would love this to be a real thing in Pokemon go then all the fanfiction could have Team Harmony turning up when they’re needed and being very mysterious. I’ve loved this design forever, but for some reason red bubble says I’m forbidden, I don’t know why this is but thank you for the Great art and I hope to get some merch soon! I shall forever, fight to stop this awful war under the name of the Beast Of The Sea. Hey! How does one pay to get this and use it for my phone's wallpaper without all the trademarks and stuff? Thanks! Hello, I unfortunately do not give access to my non-watermarked files nor do I sell licenses for it, sorry. Hmmm I get that, but then why showcase something that people can't fully enjoy given the right price? IDK you have the potential to make good money off of it, and you're just putting that watermark for really no reason. Also if you wanted to protect your art, you'd merely have to register it at your local Intellectual Property office or whatever it's called in the country you may be in, and then charge in usage fees. IDK it's a shame imo. Because I am simply not comfortable with other people using my non-watermarked work and I think that's a good enough reason. I don't want to allow people to make money out of it, even if that gives me a cut or if they pay a fee to use it. I prefer remaining the only person using it for commercial purposes and that's my right. The watermark is there for a very good reason which is preventing art thieves. If you don't know what that is, art thieves are basically people taking my image and selling it without my consent. It happens more than you know, and before I had that huge watermark on it I had to fill hundreds (yes, hundredS) of DMCA takedown request for stolen intellectual propriety to remove it from people's shop and such. My artwork is already copyrighted, it doesn't prevent people from doing that anyway. So it is safer to watermark it so it is harder for people to steal it. Fair enough. Up to you. What color did you use for the harmony logo? I am wanting to make a gym badge in the same color. for a discord group and possibly for an RP group as well and i maight even uses your logo with full credit to you in the pic channel of both. I may even request a miniture of the lugi for the two channeles. I also added your pic to my favorites on here. May I use this for a Facebook profile pic and literally nothing else? i'm not bound by any teams. not interested in a war. 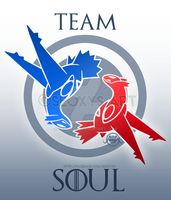 I've seen all of these team logos you made and they are awesome ... though my question is how excited would you be if Pokemon Go asked you if they could use your logos for the new teams they might make in the Pokemon Go game? Lugia's a beast in the game. Seriously it's more a end-game boss battle. have you thought about putting this up on some of the shirt-a-day sites? I want this as a shirt, but I've had poor experiences with both RedBubble and Teepublic. do you have a link to DesignByHumans? Teepublic I found to have a poor quality product. what I bought had a flaw on top of that, and their customer service would never get back to me after several inquiries. I understand you going where they treat you right... I wonder if anyone treats both the designer and the consumer right. hopefully DBH does. alright. I'll keep an eye DBH then. I'm really less than inclined to give TP another chance. I'd ask to make my own decal for my car...but the places I know locally want you to buy a bunch in bulk >< don't think that'll work. if you start making decals though, lemme know! I don't know if you are still reading these comments, but I want to thank you for making this, I myself am an instinct, and I think all this mindless conflict is stupid as well, the only reason you choose a team is to protect a gym, not say "XD INSTICT SUX CAUSE MEE EMEE" or "VALO SUX CUSE HATT" or "MYSTC SUX CAUS DEY BREGGING"
I always read every single comment I get (I just don't always answer them all because there are so many ><) thank you very much for your kind words, I'm glad Harmony could put a smile on so many faces ^^ I definitely wasn't expecting it when I drew it!! Congrats on your success with Team Harmony. This and your other team logos look fantastic. if I get the info I'll note you if you want? Awesome idea for a team! What would their color be though; blue is already taken by Mystic. I think of it as a Silver color if anything.